If you check the label and see the origin and the name Champagne on the bottle, you can be assured you are drinking the real thing. Make sure to always use a cap C for Champagne, as it is the proper name of a region in France, and no other place on earth can claim or use that name. There is no such thing as California Champagne! It might be a wine, and it might be bubbly, but the purists will tell you that it is not THE Champagne. For decades now, the province of France where the golden liquid is produced has been fighting in courts against many producers of fizzy drinks who wish to use the name of the bubbly. It's big business. Valued at $5 billion, the market of Champagne is an expensive commodity, and the real thing is never becoming cheaper anytime soon. Some producers now use machines, but the most prestigious alchemist houses still apply traditional methods and treat their wines like babies in the hands of skilled workers, to make sure the end-product clings to the pride of the name. The making of Champagne is a long story and requires many steps, and time. So the process is a very costly one, and the market prices only reflect the labor involved. Even though some argue that the Champagne vines existed since before the Romans, it might be doubtful that it was cultivated as such, since Julius Caesar never mentioned it when he made a rather complete survey of the available foods of France to feed his troupes when marching over Europe to conquer it. Or maybe it was that he wanted to keep the delicatessen drink to himself and some of his generals, and in that case would not have needed to mention it as a drink for the soldiers. We do know that the Champagne cultivation is traced back to the V (fifth) century, around 459 A.D. -and the city of Reims in the northeast part of France is where it all started. The city was where the coronation of many kings of France took place, when they were crowned in the magnificent cathedral, still standing to this day. It is also recognized as the capital of the province of Champagne. It is also in Reims that, at 2:41 the early morning dawn of May 7, 1945, Germany surrounded to General Eisenhower and the allies, officially ending WWII. It is not known if the event was celebrated by drinking Champagne. Most of the Grandes Marques (famed labels) of Champagne have their headquarters in Reims and offer tasting and tours of the caves, mazes and tunnels where bottled Champagne ages under the city. Carved from chalk, left behind by ancient oceans, some date back to Roman times. 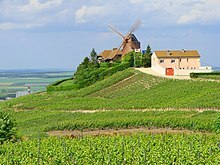 The Champagne historic wine region is known of course mostly for the production of the sparkling white wine that bears the name of the region (province). Under the EU (European Union) law and the laws of most countries the regulations reserve and preserve the name "Champagne" exclusively for the white wines of that area. The exact boundaries of Champagne are legally defined and specifically split into five producing districts: Aube, Côte des Blancs, Côte de Sézanne, Montagne de Reims, and Vallée de la Marne. So if your Champagne is not from one of these specific locations, you are not drinking real Champagne. The Champagne land is only 76,000 acres of vineyards, with 319 villages home of the 15,000 growers who make wine, or just sell their grapes. Forty additional villages might be authorized to be incorporated in the map of Champagne growers in the future, as the demand is quickly expending. England is the largest consumer of Champagne, followed by the USA and Germany far behind. The oldest Champagne house, Gosset, was founded in 1584, originally as a still-wine maker, not yet the bubbly kind. Others such as Ruinart (1729), Chanoines Frères (1730), Taittinger (1734), Moët et Chandon (1743), and Veuve Clicquot (1772) followed. Hundreds of others names were added to the list of exclusive producers, such as Heidsieck, Krug, and Mumm, to name a few. In the 19th century, the production in Champagne grew from 300,000 bottles a year to over 20 million bottles. A total of 349 million bottles were sold in 2012. All his adult life, French King Louis XIV drank only Champagne on the orders of his royal doctor, who believed the king should drink it at every meal to stay in good health. He was never in great health, but he largely influenced the fizzy wine as the royal court drink of favor. The wine was supposedly a cure for malaria; nowadays we use preventive medication, instead of Champagne. It might not be cheaper, but it has less of a drunk-related stigma. Convents of the region usually served Champagne to their aristocratic visitors traveling the country, and royal subjects visiting their lands when not at court in Paris or Versailles. Nuns and priests have also been known to favor the sophisticated wine, as opposed to the crude red beverage half-way made by local winemakers. Famous XVII (17th) century monk Dom Pérignon was one of the first to create the Champagne we know today, with his mastering of the vines and his finesse in selecting the grapes. Not all Champagnes are created equal, depending on where and how the grapes are planted and how they grow: some have higher levels of acidity; some have more power, aroma and character to their flavor. The exposure to certain weather is also determinant in the taste of the grapes. Why is Champagne fizzy? All wines have a tendency to bubble, but the invention of the most famous bubbly of them all is due to the climate of the region, which is colder than other wine producing regions, creating a process of keeping and bottling the wine to produce even more foam when corked up and kept in cold cellars. While it used to be considered part of the ceremonial of opening a bottle of Champagne to pop the cork in a spectacular way, nowadays however, restaurants and business celebration butlers open the said bottle in silence - and wine growers find it has several advantages in doing so - first is does not destroy the bubbles by letting them escape too quickly, and second, it saves the precious, and expensive, liquid from being wasted when half a glass spills on the floor at opening. As for the proper way to serve Champagne, the étiquette of sommeliers in France is to never hide the label, which is not only the signature of the producer, but also the pride of the customer. The wine should be poured close to the glass, on an incline or not, to allow the formation of a pouring cord and to avoid excess foam. Connoisseurs know to put their glass to their ear and listen to the sound of Champagne, a crackling murmur pleasing to the drinker. Never fill more than half a glass. If several flutes need filling, it's best to pour a little bit in each and come back for more after a few seconds, to let the bubbles settle in the glass. Best served at precisely 48 degrees Fahrenheit. To achieve that, the best way is to keep it in a wine cave (hum, who has a cave, right?) in a bucket filled with a mix of water and ice cubes for 15-20 minutes, and its temperature will be perfect. If you want to keep the bottles in the fridge, they must be resting horizontally for 3 to 4 hours before being served. Champagne does not freezes. While it's fairly easy to find a bottle of Champagne for about $40, some houses market their bottles in the $100 to $300 price range, depending on the region and the year. But if you check the label and see the origin and the name Champagne on the bottle, you can be assured you are drinking the real thing, and it is like no other. More info, in English, here. Enjoys the holidays, but never drink and drive, nor drive and text! And most certainly do not drive and drink and text! Become a fan, and my stories will go directly to your email.